526 pages | 33 Color Illus. | 235 B/W Illus. An optical cavity confines light within its structure and constitutes an integral part of a laser device. Unlike traditional gas lasers, semiconductor lasers are invariably much smaller in dimensions, making optical confinement more critical than ever. In this book, modern methods that control and manipulate light at the micrometer and nanometer scales by using a variety of cavity geometries and demonstrate optical resonance from ultra-violet (UV) to infra-red (IR) bands across multiple material platforms are explored. The book has a comprehensive collection of chapters that cover a wide range of topics pertaining to resonance in optical cavities and are contributed by leading researchers in the field. The topics include theory, design, simulation, fabrication, and characterization of micrometer- and nanometer-scale structures and devices that support cavity resonance via various mechanisms such as Fabry–Pérot, whispering gallery, photonic bandgap, and plasmonic modes. The chapters discuss optical cavities that resonate from UV to IR wavelengths and are based on prominent III-V material systems, including Al, In, and Ga nitrides, ZnO, and GaAs. "Optical micro- and nano-cavities underpin many of the major developments in current photonic science and technology. 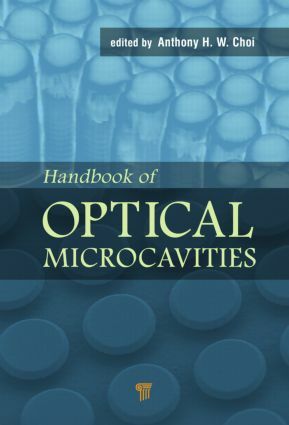 Given the sheer diversity of materials, wavelengths, cavity configurations, and applications being investigated, the organised overview provided by Dr. Choi’s excellent Handbook of Optical Microcavities is particularly timely. The judiciously selected chapters cover all the key themes and will provide an invaluable and accessible reference to students, researchers, academics, and those working in applied science." "This edited volume provides a snapshot of the achievements and challenges of the development and application of optical microcavities. It covers topics ranging from photonic crystal microcavities for lighting applications to optomechanical resonators, as well as simulation of planar photonic resonators and MOCVD material growth, among others. The experts who contributed the 13 chapters have produced a highly readable, well-illustrated book. Apart from the chapter on resonator simulation, the authors keep mathematical content to a minimum and emphasize the physical aspects. The editor doesn’t explicitly identify a target audience, but this volume will be a useful first point of contact for those just beginning research in this field as well as more experienced practitioners who require a clear introduction to the basic ideas." Anthony H. W. Choi is associate professor with the Department of Electrical and Electronic Engineering, University of Hong Kong. He received his PhD from the National University of Singapore and did his postdoctoral training at the University of Strathclyde, Glasgow, where he pioneered development work on GaN-based emissive micro-light-emitting diode arrays. Currently, Dr. Choi leads a team of researchers investigating frontier research topics, including solid-state lighting, micro-cavities, nanophotonics, and laser processing of devices at the Semiconductor Lighting and Display Laboratory of the University of Hong Kong.